Boxer puppy is an awesome buddy. So adorable, delightful and high-spirited in its character. They are highly rated among the puppy-lovers for many of their distinguished features. 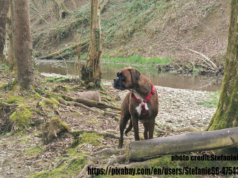 In this article, we’ll describe the important features of the boxer puppies and some caring instructions recommended for parenting a boxer puppy. 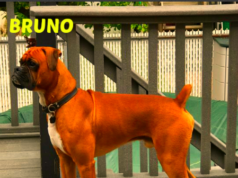 2 What age is recommended to adopt a boxer puppy? 6 What to be fed to a boxer puppy? Although, there is no standard figures about the size and weight of a boxer puppy; because different puppies grow at various paces. It also depends upon the environment and diet they’re getting. However estimation is; the healthy average size of male boxer puppy would be 18-20 lbs in 10 weeks of age and the female might gain the weight of 10-12 lbs in the same age. What age is recommended to adopt a boxer puppy? It is better to adopt or purchase a boxer puppy aging between 8-10 weeks. Because till this time, the boxer puppies are fed and maintained by their moms. When a puppy becomes 8 weeks older, he or she is ready to be taken to a human family and it is mature enough to be mixed up. In some parts of the world, adopting a puppy at a very early age is not allowed. It is also suggested, when you bring a boxer puppy, it should be pre-planned decision. And if you are having more family members, everyone must be taken into confidence. The boxer puppy will take time to adjust itself in the environment which is being provided by its owner so if it creates some mess, the attitude of all family members should be tolerable. The new family member shouldn’t be hugged, kissed or patted too much in the start. It is not good for your puppy’s health either. It can be done later with the passage of time when it is totally mixed up and truly familiar with all family members. It is normally observed, all humans might not be the pet-lovers and sometimes if a family members dislikes a pet, his or her attitude might be harsh and rude towards the pet. That can be resolved and addressed with mutual understanding. Before taking your boxer pup home, it is always recommended, all the needs and requirements for your puppy are fulfilled at home. His place should be with full of comfort and having cheerful items for its play. 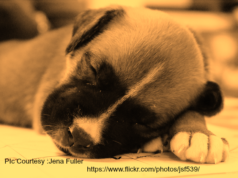 A boxer puppy with all of its needs fulfilled is a really splendid companion. 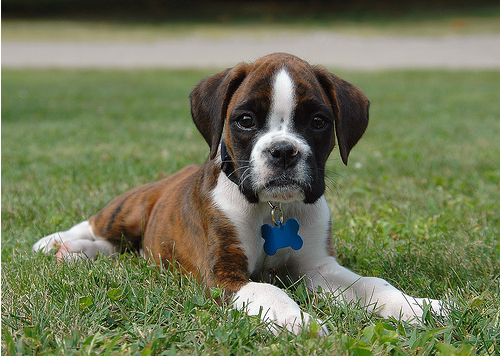 Providing your boxer puppy with suitable and appropriate diet carries the most importance. Your boxer-puppy requires to be fed 3-4 times a day. He is in the growing stage so absolute care is needed in this regard. The bowls or pots being used for your puppy should be regularly cleaned and washed. What to be fed to a boxer puppy? Well truly this is a million dollar question. Remember, when the young chap was brought at home, he was only a few weeks older. So now he/she is in the fast growing stage and he/she deserves the nutritive and health-giving diet. After 4-6 weeks normally the boxer puppy starts taking solid food. If you prefer to prepare the food for your puppy at home; better go for, white meat which is softly cooked, some beans type veggies and gently cooked rice which are good for your boxer puppy. After 8-10 weeks, proper charting and scheduling of the solid food for your puppy is recommended. Although, there are many food supplements available in the market for your boxer’s feed, but they are not normally having which they are actually advertising. It is always better to prepare food at home. Boxer dog is carnivorous, so meat is the best thing which can be provided to him or her. And always remember, preparing food at home is always budgeting bearable. Like the human baby, the boxer puppy is also requiring the proper vaccination. This is really essential for the good health free from germs for your puppy. 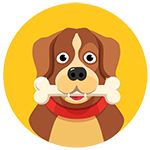 Make sure your veterinarian is having the updated vaccinations available with him. Always make sure, the body of your puppy is always clean. Particularly the sensitive organs like eyes, nostrils and ears are perfectly cleaned. Always pay attention, when your puppy is breathing abnormally. Sneezing, coughing and other cold effects can be seriously dangerous to the health of your puppy. Normally, if your puppy is crying, it could be hungry, toilet need or some other discomforts, so it should be responded quickly. This action is also highly beneficial in the training of your puppy. Some boxer puppies are sometimes allergic to use the diapers and other like stuff. The best thing is to maintain a disciplined bathroom and toilet routine for them. At the earlier stages, an alarm or timer could be set. Be patient in the start as you might face some cleaning incidents too often. Repetition of toilet training is critically important and it should be done with smaller intervals in the beginning. Believe you us; this energetic entrant in your family is a gorgeous and tantalizing addition among you all. They look really adorable while running, jumping and bouncing. Oh yes, never forget, he’ll please you all with the showcasing of the boxing techniques as well. Their cute faces also grab the attention of everyone. They throw sensational smiles when happy. Sometimes they can be stubborn or harsh but all of these are result of their intelligence as they are sensitive beings. Address their stubbornness gently and timely. Sometimes they are aggressive with their other age-fellow puppies, so their proper socializing is also a must to do thing. Parenting a boxer is a cool thing, if you have fulfilled the important credentials needed for that.